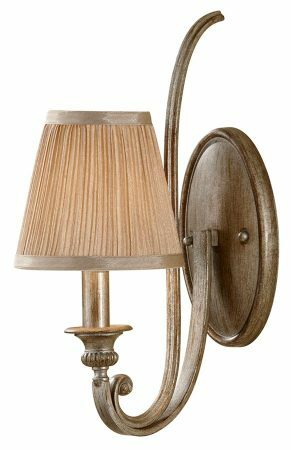 This Feiss Abbey silver sand single wall light with mushroom pleat shade is influenced by monasterial architecture and features a sweeping arm, hard backed pleated fabric shade and candle style light. Please note that this wall light is not fitted with a switch. Cameo wall bracket and stylish curved metalwork arm finished in silver sand, with hand applied gold brush. The arm feature inner scrolled detail and supports a candelabra style candle light, with sconce and candle tube; topped with a tapered mushroom pleated fabric shade that gives a wonderful soft light. The elegant Abbey range is a classic transitional model which is suited to many interior styles. It features mushroom pleated shades and soft silver sand finish with hand brushed gold detail. The Abbey is beautifully crafted in a timeless style and an indulgent pleasure you will never tire of admiring. This elegant wall light is ideal for use in any room and looks wonderful in any bedroom, hallway, dining room or living room. This elegant light is supplied by Elstead Lighting and designed in the USA by Feiss, founded in New York in 1955. They have become well known over the years for their contemporary yet classic styling, quality and great original designs like the Abbey silver sand single wall light with mushroom pleat shade you see here.